Most of us tend to associate future urban mobility with electric and autonomous cars, bike-sharing , e-scooters, etc. What these modes of transportation have in common is that they all rely on the street – an already quite congested space in densely populated cities. What if we could use the airspace? And indeed: Advances in electric propulsion , autonomous flight technology and 5G communication networks will soon spawn commercial passenger drone services and thus add a new dimension to the urban transportation mix of the future. 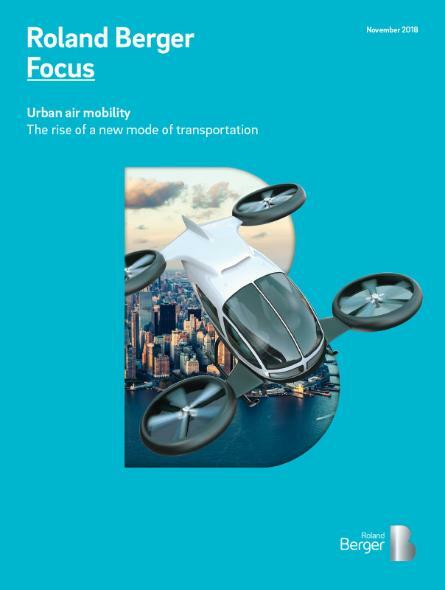 As the Roland Berger-study “Urban Air Mobility – The rise of a new mode of transportation” shows, drone services could provide an attractive solution for areas where merely increasing two-dimensional capacity would in no way ease the existing traffic situation. Users of air taxis will not only experience a very time-efficient mode of travel and a safe, enjoyable flight experience, but will also be able to move at increasingly low cost as better batteries, new aircraft designs and – towards the late 2020s – autonomous flight technology bring prices down. Convenient, fast and increasingly cheaper: within in a couple of years passenger drones will be part of the urban mobility mix. Flagship pilot projects are already scheduled to go live in cities like Dubai, Singapore, Los Angeles and Dallas in the early 2020s, with Roland Berger predicting about 3,000 passenger drones in use by 2025 as the first commercially used urban air mobility routes start operating. 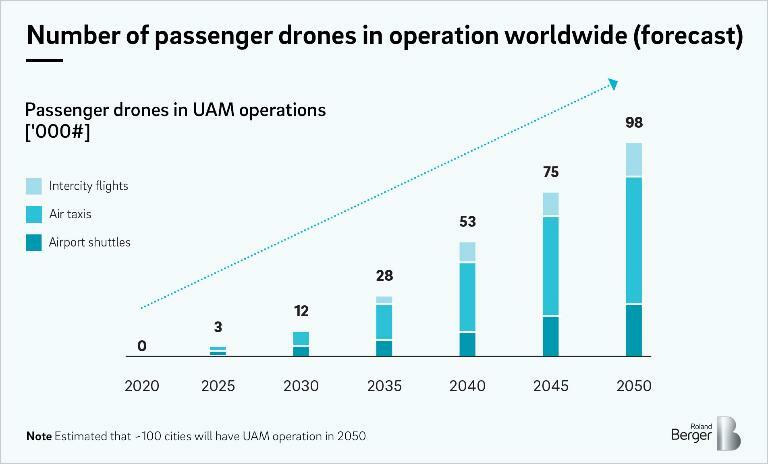 Over the following decades, the market is expected to grow exponentially: By 2050, the authors estimate close to 100,000 passenger drones could be on the move worldwide and serve as air taxis, airport shuttles and intercity flight services. Until then, however, a number of technological, infrastructural and legal hurdles remain. First of all, choosing the right technology for each use case is central to the nascent industry. It is yet to be determined what the first drone for urban air traffic will actually look like. 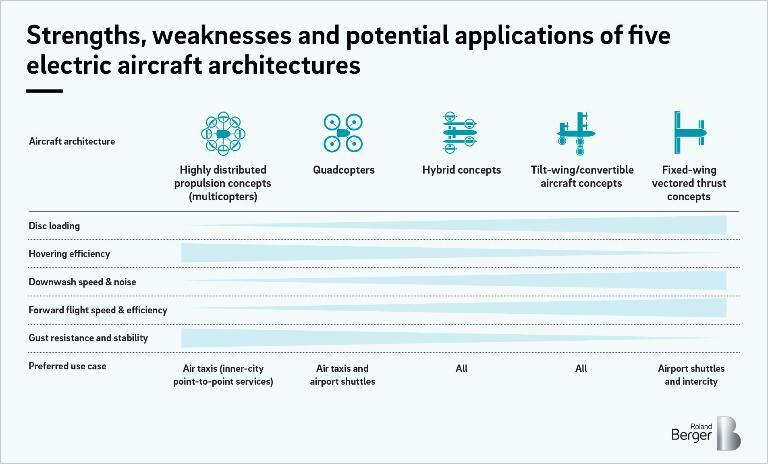 The most promising architectures include multi- and quadrocopters, tilt-wingers, electrical vertical take-off and landing (eVTOL) aircrafts as well as hybrid constructions. While the former types are particularly suitable for inner-city operations in confined spaces, the fast flying vertical starters are ideal for use between longer distances. Another crucial factor for the emerging urban air mobility market is the appropriate infrastructure: eVTOL landing sites, charging infrastructures and maintenance facilities are among the key enablers for successful operational business models. Furthermore, urban aircraft require a safe and unobstructed landing zone that needs to be approved by the authorities. A robust 5G cellular network will also be imperative to enable communication among eVTOL aircraft, between eVTOLs and other flying objects, and between eVTOLs and control centers. 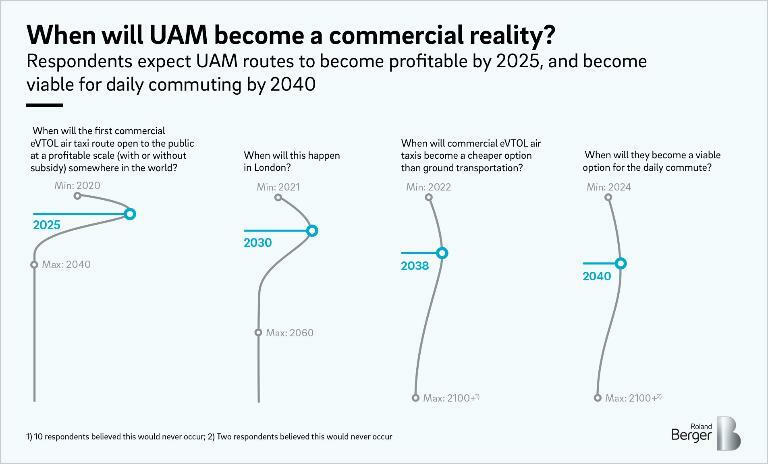 In November 2018, Roland Berger and the Aviary Project jointly conducted a poll of ~60 participants in the burgeoning Urban Air Mobility (UAM) sector, asking when and where UAM may become a commercial reality. Respondents broadly agreed that a first commercial and profitable eVTOL air taxi route would open somewhere in the world by 2025. Almost 40% of respondents thought Dubai would host this first route, with another ~30% and ~20% believing it would instead be a city in the USA or China, respectively. When asked when eVTOLs may become cheaper than ground transportation and viable for the daily commute, respondents were much less certain, with responses ranging from the early 2020s, to beyond 2100 (almost 20% of respondents felt eVTOLs would never become cheaper than ground transportation). Nevertheless, on average, respondents held that eVTOLs would reach cost parity by 2038, and become viable for daily commuting by 2040. This is one of the reasons why the Bavarian city of Ingolstadt , part of the Greater Munich metropolitan area and member of the EU-supported "Urban Air Mobility Initiative", relies on targeted partnerships. In addition to the Federal Government and the state of Bavaria, Ingolstadt brought representatives of the economy, the neighboring airports and other stakeholders to the table at the start of the project. Together, possible fields of application should be defined and necessary conditions for the test operation created. If, like in Ingolstadt, the various actors in this promising new market manage to work together closely, Europe could be the starting point of a revolution in mobility. The winners in this exciting new market will be the ones who approach its complex, interdisciplinary needs in close collaboration. 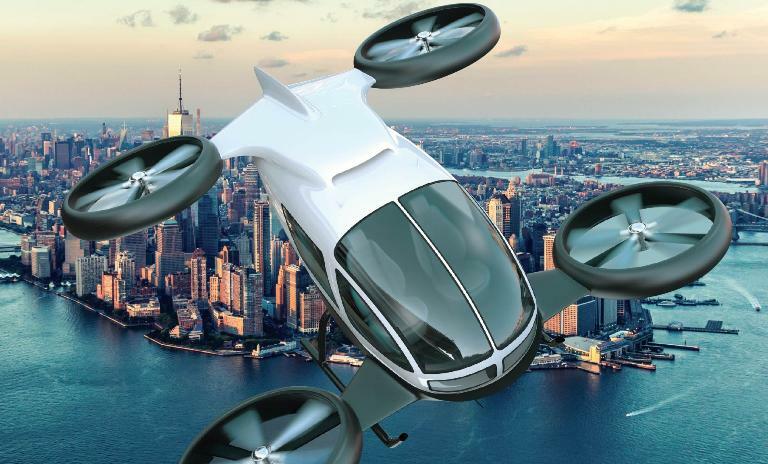 Manufacturers, operators, infrastructure providers and regulatory authorities need to develop a kind of urban air mobility eco-system, as "going it alone" will not be an option for any of the players. As a number of cities race ahead with pilot projects for passenger drones, the beginnings of an ecosystem for urban air mobility are beginning to take shape.